Turmeric (Curcuma longa) is a rhizomatous herbaceous perennial plant of the ginger family and is the main ingredient in curry. It has a warm, bitter taste and is frequently used to flavor or color curry powders, mustards, butters, and cheeses. The noticeable yellow/orange pigment of turmeric is called curcumin. Curcumin is thought to be the primary pharmacological agent in turmeric. In numerous studies, curcumin's effects have been shown to be comparable to the potent as well as over-the-counter drugs. 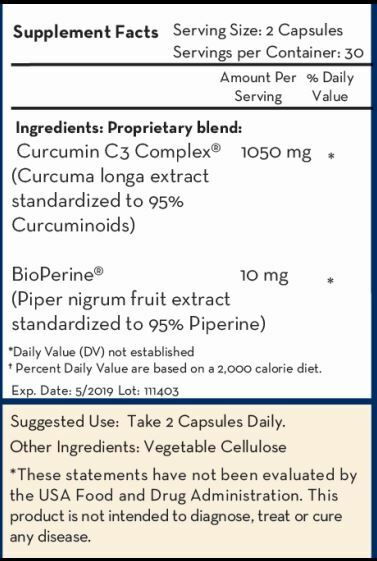 Unlike the drugs, which are associated with significant toxic effects (ulcer formation, decreased white blood cell count, intestinal bleeding), curcumin produces no toxicity. Curcumin C3 Complex is the foremost clinically studied natural and antioxidant with a variety of health benefits. 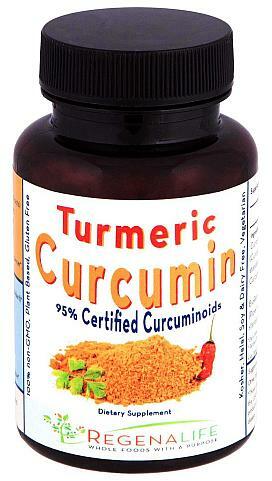 RegenaLife's Curcumin Brand is a mixture of curcuminoids, not just curcumin. It also contains 2 other Curcumins called demethoxycurcumin and bisdemethoxycurcumin. The most active ingredient in turmeric root, bisdemethoxycurcumin, boosts the activity of the immune system, helping them to clear the amyloid beta plaques characteristic of the disease. In healthy patients, immune cells called macrophages, which engulf and destroy abnormal cells and suspected pathogens, efficiently clear amyloid beta, but macrophage activity is suppressed in Alzheimer's patients. Using blood samples from Alzheimer's patients, Drs. Milan Fiala and John Cashman have shown that bisdemethoxycurcumin boosts macrophage activity to normal levels, helping to clear amyloid beta. Fiala and Cashman also observed that bisdemethoxycurcumin was more effective in promoting the clearance of amyloid beta in some patients' blood than others, hinting at a genetic element. Further study revealed the genes involved are MGAT III and Toll-like receptors, which are also responsible for a number of other key immune functions. Bisdemethoxycurcumin enhances the transcription of these genes, correcting the immune defects seen in Alzheimer's patients. Proc Natl Acad Sci U S A. 2007 Jul 31;104(31):12849-54. What are the health benefits of Curcumin C3 Complex? Powerful antioxidant, Boosts immunity, Supports healthy cholesterol levels, Supports healthy blood sugar levels, Blocks platelet aggregation, Protects liver from toxic compounds, Stimulates macrophages to boost your body's natural defense. Our Turmeric & Curcumin are free of wheat, processed sugars, syrup, gluten, corn, salt, hydrogenated oils, soy, rice, barley, dairy, egg, yeast, caffeine, crustacean shellfish, synthetic sweeteners, artificial color, fragrance, preservatives, monosodium glutamate (MSG), and genetically modified organisms (GMO's). This product is not irradiated.